« Countryside Alliance Rural Business Awards – Sulgrave Village Shop becomes a Regional Finalist. Advent Calendar Window No. 9. The Cove, Manor Road. Temperature around zero but the bitter wind has dropped. Friday night. Everyone happy and well wrapped up. Make the most of it – blizzards tomorrow? More pictures in rest of entry. Click here to see train circulating. 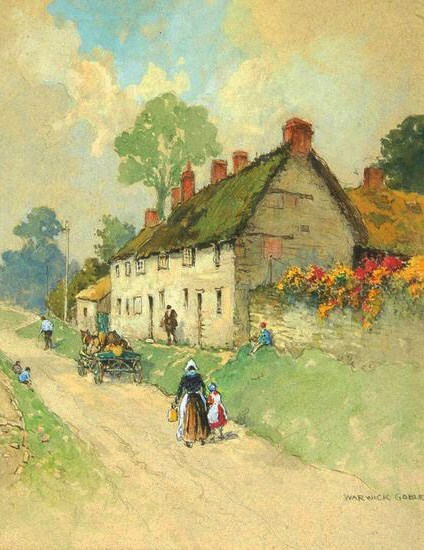 The above watercolour, painted by Warwick Goble in 1910 and entitled “Old Cottages at Sulgrave” shows the group of terraced houses formerly known as “Spring Gardens” in Manor Road on the opposite side of the road from the Star Inn. Only the left hand end of the terrace remains, the greater part of the building having been demolished in the early 1930s. The painting was discovered at a Bloomsbury art gallery in 2009, acquired at auction and restored to the village. My name is Colin Wootton and I look after the Sulgrave Village Website. I’m 71 years old and have lived in the village pretty well all of my life. 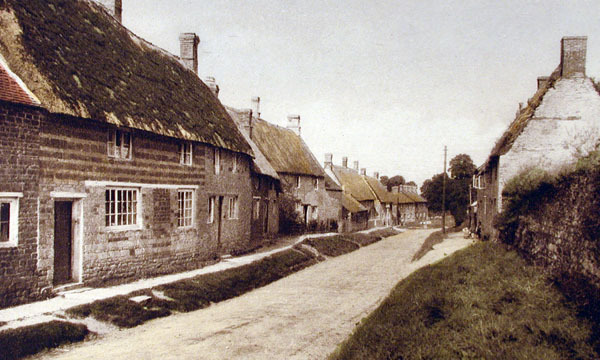 Both my parents’ families have been established in the village for several hundreds of years. 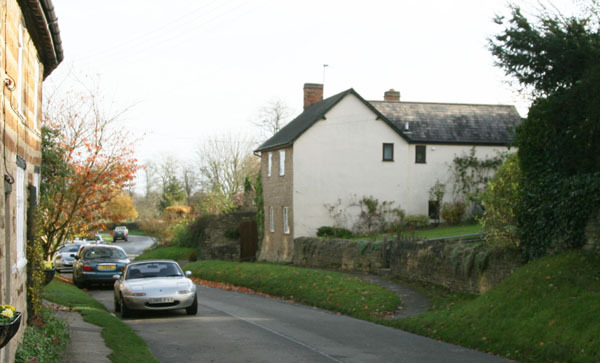 My mother was born in the cottage shown in the picture (known as “Spring Gardens”) and lived there with her 11 brothers and sisters until the early thirties, when it was pulled down (a small part remains). From a picture postcard of Manor Road, possibly in 1910 when Warwick Goble painted his picture. I am delighted to have re-connected the painting with its past – and I very much hope that you will be able to acquire it and take it ‘home’. Perhaps some old relatives of yours may even be present in the picture! Whilst the figures in the picture are probably from Warwick Goble’s imagination rather than “sitters” at the time, it is conceivable that some of them may represent my relatives. 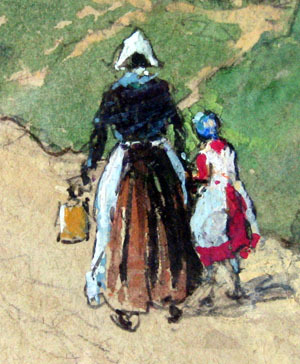 Could this be “Granny Branson” bringing the milk home with one of my mother’s elder sisters? 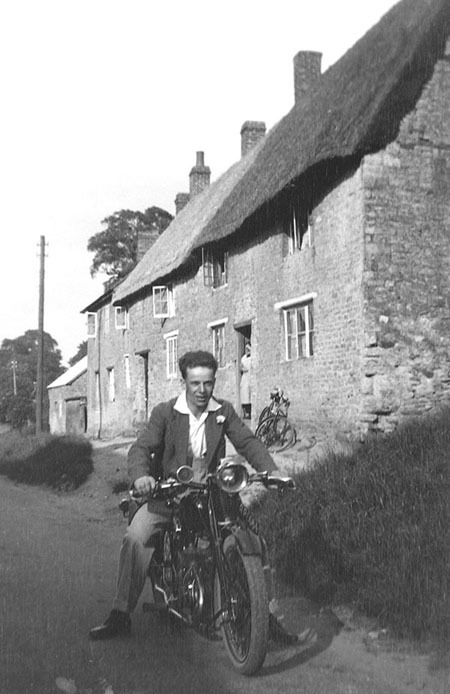 Here is a picture of Spring Gardens taken in the late 1920s or early 1930s, with my Uncle Cyril Branson astride his motor-cycle in the foreground (Granny Branson is indeed present in this picture, in the doorway). …and here is a recent photograph of what remains of the original Spring Gardens terrace. The gate in the wall on the right of the photo leads up to the houses which are currently known as Spring Gardens. Having never bought a picture at auction before I attended the sale after a thorough briefing by Bill Smith and, following a brisk round of bidding, acquired the picture at a little more than my “reserve” price! It now hangs in my hallway. So, who was Warwick Goble? This extract is from a fascinating website containing a biography of Warwick Goble and many examples of his pictures. Villagers are cordially invited to pay a visit and view the painting at first hand at Dippers Cottage, Little Street. This entry was posted on Saturday, December 9th, 2017 at 9:18 pm	and is filed under News. You can follow any responses to this entry through the RSS 2.0 feed. You can leave a response, or trackback from your own site.